The fact that actor Natasha Gordon's debut play as a writer is the first by a black British woman to hit the West End is both wonderful and shaming. ‘Nine Night’ is an extremely good piece of writing; still, only the most demented champion of Theatreland would possibly suggest that no previous work in the long history of drama by black British women deserved this. Still, it’s happened at long last and it’s cool to see Gordon enjoying this victory lap herself. She didn’t star when ‘Nine Night’ premiered at the National Theatre’ earlier in the year. 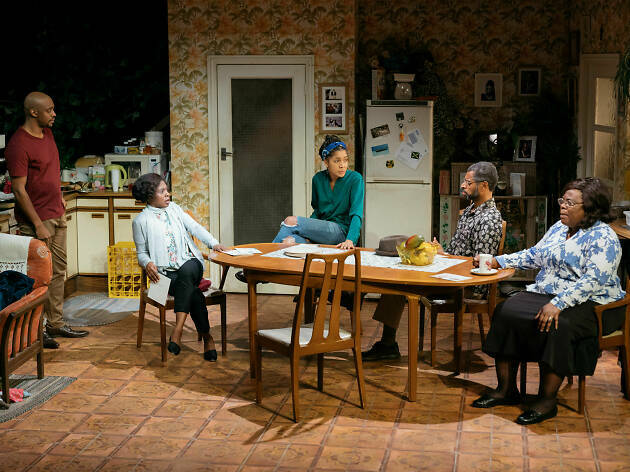 But now she takes over the role of Lorraine, turning in a sturdy, eventually heartbreaking turn as the sensible youngest daughter of Gloria, a beloved Jamaican matriarch who passes away, unseen, in her suburban London home at the start of the play. In fact a lot happens offstage in Roy Alexander Weise’s beautifully judged production. The play takes its name from a Jamaican mourning ritual, but we never see the wake itself. Gloria’s immediate family are forever taking refuge in her kitchen as the treacly throb of music filters in from busier rooms – there is the sense that they are the restless, displaced spirits, while the unseen Gloria remains the assured lynchpin of the family. ‘Nine Night’ is absolutely not the first drama about a fractious, semi-estranged family who drip drip revelations out over the kitchen table. But few feature so many characters drawn so exquisitely. From Gordon’s Lorraine, outwardly the sensible, sane one, but inside screaming with loss, to Oliver Alvin-Wilson as her blokey, pathologically ill-at-ease brother Robert, every character is sharply and sensitively created piece of the emotional puzzle. The play has a lean 100-minute run time, and a couple of characters only have comparatively minor roles. But what they do say, matters – Gordon has a great sense for the bizarre dynamics of family. And, of course, it’s a Jamaican family. Anybody from an immigrant household (hello!) will be able to relate to Gordon’s acute evocation of a generation gap that yawns across actual nationalities. But ‘Nine Night’ is more specific than that. It is a look at the legacy of the Windrush generation, what they took with them, and what they left behind. And it features a comic masterstroke of a performance from Cecila Noble as Lorraine’s stony-faced Jamaican auntie, Maggie. Her outrageous self-importance and constant, largely useless advice are so consistently sidesplitting there’s the worry she might overpower the rest of the play. But actually the general sense of hysteria her presence engenders is effective in keeping us subtly unbalanced throughout, to such a point that a pivot towards the supernatural at the end feels both reasonable and powerful. It’s important that ‘Nine Night’s place in history is appreciated: but it’s at least as important to remember that it’s a bloody good play. 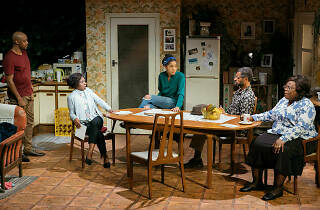 A play about traditions and the strength of family or lack thereof. The script is peppered with one liners and jokes relating to heritage and family values. Cecelia Noble gets the majority of the laughs as Aunt Maggie, she just had to breathe and it was funny. For me, the stand out performance was Franc Ashman as Lorraine, she had the right amount of grief, resentment and the want to honour her Mother's memory, that one would expect when a parent dies. This is a culture I knew little about and I came away having learnt a lot. The ending is satisfying, if a little unnerving, try and get a ticket if you can! This was a highly entertaining yet eye-opening play for me. I learnt a lot about Jamaican culture, and even though I did not fully relate to all the jokes, I could see the audience was roaring with laughter. There was a lot of humour running through the backbone of the play, but there was also a serious side which questioned cultural identities and how much we should cling on to tradition in the face of modernity. I highly recommend the play and the acting was top notch! The set was simple, but this was done on purpose so that it would allow the audience to focus on the top talent on stage. Hurry and see it before the run finishes!